One of my biggest passions is helping high school golfers figure out the best path for them to play golf in college. Unfortunately, for those who are just starting the process it can be daunting and overwhelming. No two students’ paths look exactly alike, but there are some common errors that I’ve seen over the years that limit the options of many student-athletes. Collegiate Coaches will not come seek you out most of the time. The student-athlete must be proactive in reaching out to coaches. Notice there I said the student, not the parents. If parents are initiating the contact with the coach, this is a big red flag to them. They want to know that the student coming to them can function independently. According to juniorgolfscoreboard.com, there are currently 1,289 Men’s programs in the United States. For Women, there are 939 programs. These programs are split amongst Division 1, 2, 3 for the NCAA, but there are also opportunities to play for an NAIA school or to play at a Junior College. In 2018, it was reported by the NCAA that around 200 scholarships went unclaimed in Women’s Golf. There is definite opportunity to play, and to potentially play with a scholarship. College coaches expect you to be committed to your golf game. That means, if they look at your tournament results and all that’s there are matches from the high school season that lasts for 2-3 months out of the year, they will assume you aren’t very serious about playing competitive golf. To sufficiently build their golf resume, the student/athlete needs to play in tournaments throughout the year. The summer is a great opportunity to play in events that will be beneficial toward building that playing resume. The Junior Tour of Northern California provides opportunities throughout the year to play additional tournaments, as well as providing a path toward AJGA events, which are the elite level events for junior golf in the United States. Visit their website at www.jtnc.org for more information. Sitting down and evaluating where you want to go to school, what the current state of your golf game is, and what action steps you need to take is an important starting point. At Woodbridge, our Aim for College Golf program is designed to help student/athletes create a roadmap to having a successful High school Golf career and navigate the College Golf process. Space is available in the program for Woodbridge members. 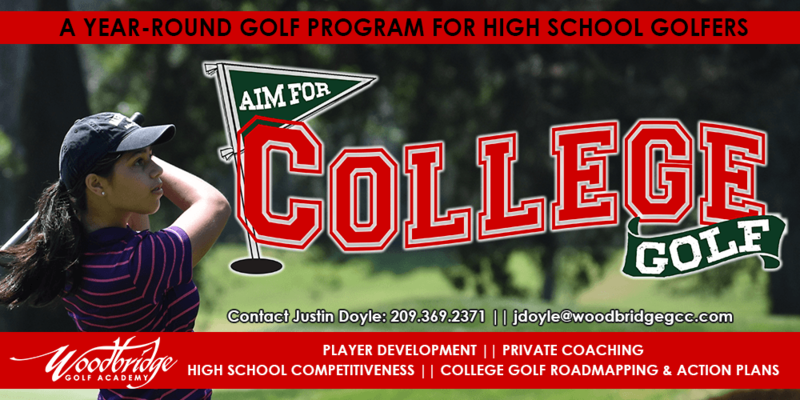 For more information about Aim for College Golf, please contact Justin Doyle. For membership information, please contact Kristine Roberson.